Me, on other hand! On my last day of maternity leave, I cuddled aggressively with B3 until he squirmed and got bored, blew raspberries with him, and watched him nap with an intensity that was probably a little bit creepy. And the next day, when I put on real clothes that require things like buttons and dry-cleaning, and drove somewhere that wasn’t just the supermarket, I got there and I just watched him all day on the baby cam with pretty much the same intensity. Predictably, a lot of coworkers have been asking whether I’m happy to be back at work. I get the sense that the right response is something like you know, I really didn’t think I would want to go back but I was ready! or I got surprisingly stir-crazy, it’s nice to actually talk to adults! or somewhere along those lines. Being a terrible liar, I don’t think I’ve managed to convince anyone that this is the case. I didn’t really get stir-crazy; I am fairly certain that a good chunk of my adult vocabulary has leached out of my brain (and with it, my ability to converse normally with adults — wait, did I ever have that?) to make room for random high-pitched noises and variations on “peek-a-boo,” but I’m cool with this. 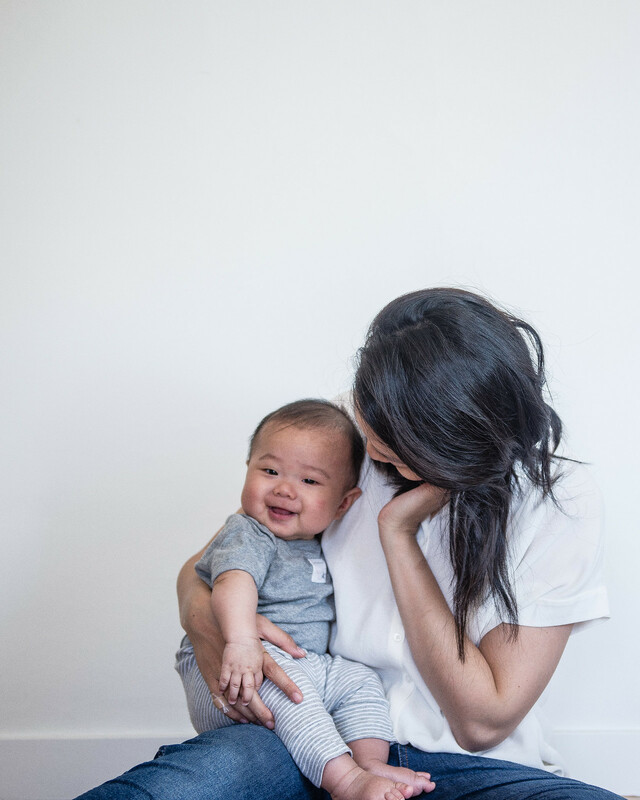 To be totally honest, I really, really loved being a stay-at-home mom, and I treasured the weeks we had where it was just me and little man, day in and day out. I’m missing it, and Luke, a lot these days. Still, I’m grateful to be at a firm that gave me the length of maternity leave that I had. Knowing how hard it was for me to go back leaves me in awe of the many moms who go back to work far earlier. (That said, I also know full well that the mamas who do stay at home with their littles don’t have it easy by any stretch, either.) Even though I can’t help but be a little melancholic that it’s over, there are things I’m learning to love about our new normal: Our hazy early-morning hours, traipsing around the apartment to open all the curtains and let the sunshine slant in, our rosy evenings, with the biggest, eye-squinching, face-stretching welcome-home grins, and cuddles before bed. A friend at another firm told me that you feel more “present” in the hours that you are home, even though they’re fewer. Whenever I’m tempted to worry (you know, not at all dramatically) that Luke won’t love me as much as he might have if I was home full-time, I remember that he loves his papa with an all-encompassing, shining adoration, and B2 has been back at work for months and months more than I have. If papa had to do it, so can I. And anyway, I’m pretty sure Luke plans to hit all his developmental milestones on the weekends only. The cooking around here has been minimal for the last several weeks, quick salads and little armies of Tupperware’d casseroles to make more time with B2 and B3. A month or so ago, though, I made this simple-but-special pasta with Mother’s Day in mind. A little springtime riff on this pasta from Cook’s Science, it lends comfort (don’t all mamas need some of that?) from a silky sauce that comes together with roasty garlicky oil, starchy pasta water, and a dollop of Vermont Creamery mascarpone. I never knew that mascarpone could work so well in a savory application, but it’s the perfect, subtly creamy base for pungent garlic, and becomes beautifully bright when matched with peppery shiso and lots of lemon. 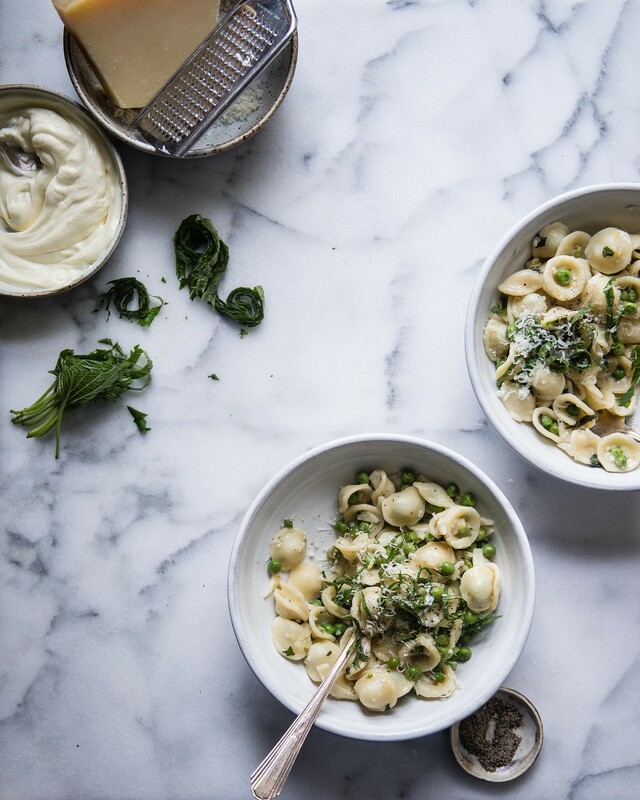 On top of that, tender green peas get cupped up in the little ears of the orecchiette and tuck some sweetness into every savory bite. (I could eat green peas plain — and may or may not finish Luke’s leftovers when I make him green pea purée. Am I the only one who finishes their child’s baby food?) 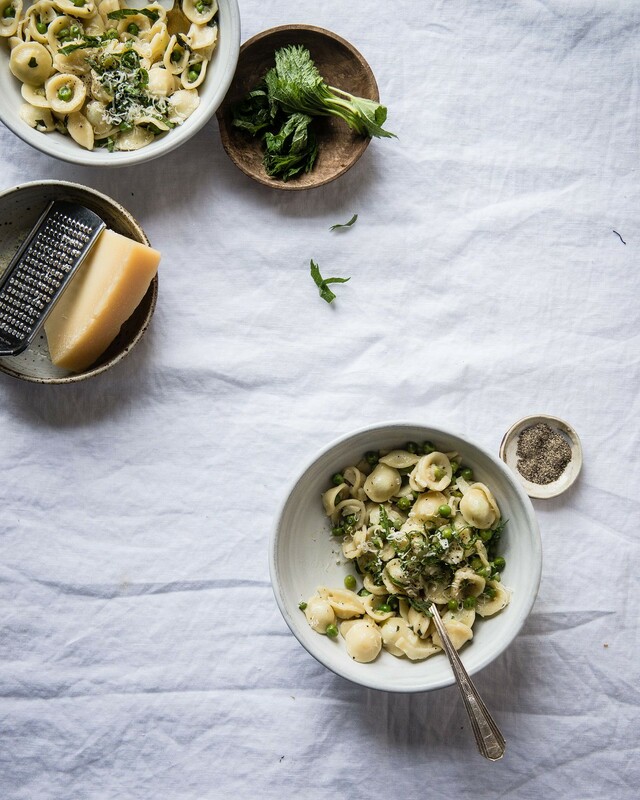 The pasta has heft but plenty of vibrancy, and it’s the kind of light but substantial meal that feels perfectly happy and celebratory for a mama’s special day. I hope you have wonderful Mother’s Days ahead, or just a wonderful Sunday, too. 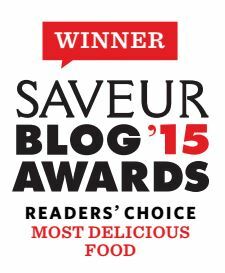 Thank you to Vermont Creamery for sponsoring this post! All opinions and unrelated ramblings about motherhood are, of course, my own. Reserve 1 cup of the starchy cooking water, then drain the pasta and return it to the pot. Add the peas, lemon zest and juice, reserved garlic-oil mixture, and ¾ cup of the pasta water to the pasta. Stir until pasta is well-coated with oil and no water remains in the bottom of the pot. Add the mascarpone, Parmesan, and shiso leaves. Toss until the cheeses melt and evenly coat the pasta. If needed, loosen the pasta with the remaining ¼ cup pasta water. Season with more salt and plenty of black pepper to taste, then serve, with extra Parmesan on the side and more shiso, if desired. Enjoy! Hugs to you, Kate!! I know, I imagine a part of me would never have been ready. But there are always pros and cons to all things, right? 🙂 Thank you for such sweet words, and cuddles to Nino! No matter how tiring our kids make us, it’s so hard to stay away from them. Mine started full time pre school and while I miss him at times, I also so much enjoy the me time and getting work done without him constantly running behind me 🙂 I am sure you are enjoy all the adult talk too. That pasta bowl looks so clean and fresh. Just the kind I enjoy any time of the year. Thank you so much for this, Kankana. You’re totally right, it’s not the worst thing in the world to be able to sit uninterrupted and concentrate on something for longer than a naptime 😉 I appreciate your words from a fellow mom so much — thank you! I feel this way with my dogs too and so I cannot imagine how much more intense the missing feelings are with you. As a kid with full time working parents, I was more than happy to have my parents leave me and my sisters alone at home. So much mischief..lol. I loved that they worked and as an adult, I now appreciate that they got time away from us riff raff kiddos. So you know, he’ll be fine. Just love on him extra hard when you get the chance. Kids are pretty full of themselves like that. Haha, I loved this perspective, Edlyn. Distance does make the heart grow fonder! Thank you for always making me smile with your thoughtful and uplifting comments. They mean so much. Give your pups a cuddle for me, please!! Also love this pasta. 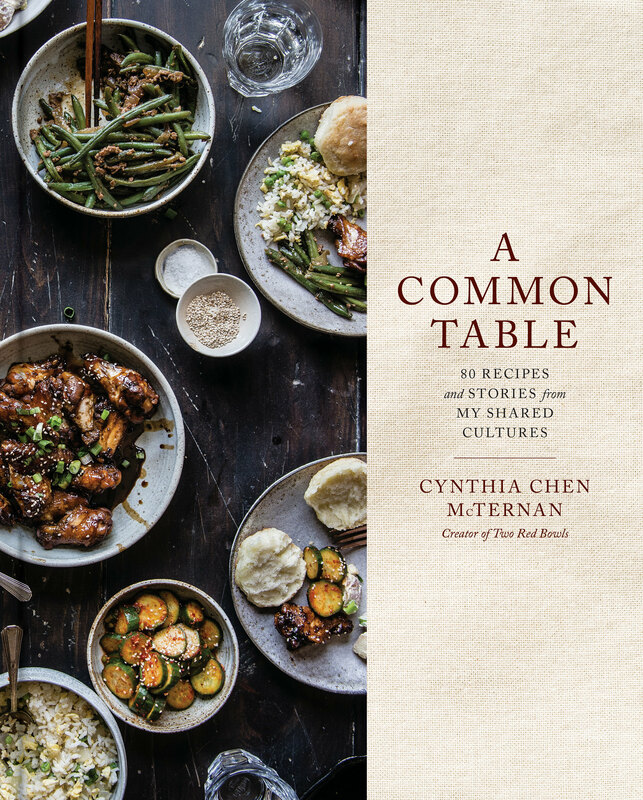 You always make me love home cooking with your ideas. I hope your book has lots of pasta recipes!! Haha! That sounds like an excellent restaurant — I’ve always wanted to try nettles but never have! Thanks so much for your kind words, Maria. Very sleepily, with lots of coffee, and often not very well! Hope all is well with you, friend! Thank you, Astrid! This is exactly what we’re keeping in mind. I appreciate your words! Me too! B2 even commented that it was neat how the peas get tucked all cozy into the orecchiette. I never used to think about how pasta shapes are suited to different dishes, but it really does make a difference, doesn’t it? Thanks so much for the super kind words, Kelsey 🙂 It was a wonderful leave! I love the stories you accompany with your posts. They are always a delight to read. Congrats on returning to work and many for happy coos with your little one and happy meals to boot. Jane, you are so kind. Thank you for always stopping by and for your friendship. Hugs to you, and cuddles for handsome Mr. Bartles! 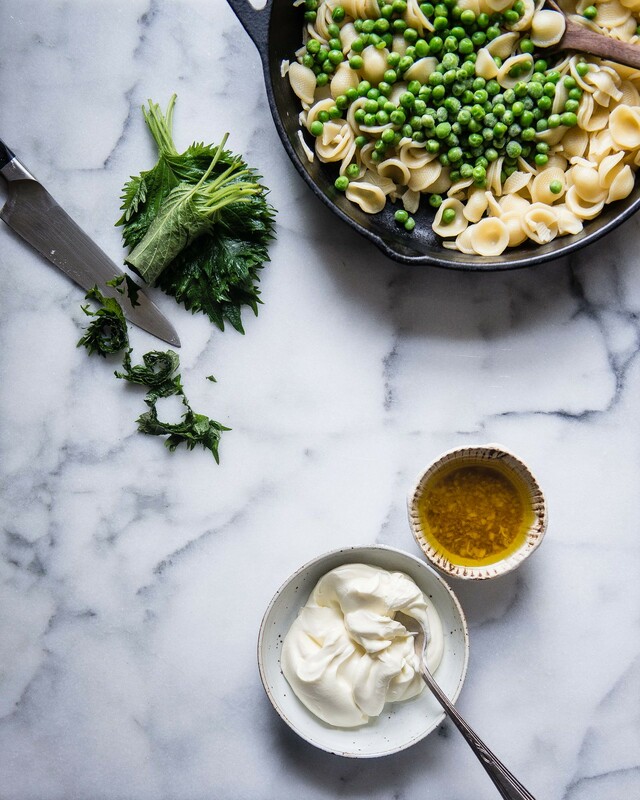 Orecchietti is the absolute perfect pasta for peas, and I can’t imagine how good the roasted garlic and mascarpone are together. You deserve all the bowls of pasta for going back to work. Thank you so much for your kind words, Allyson! 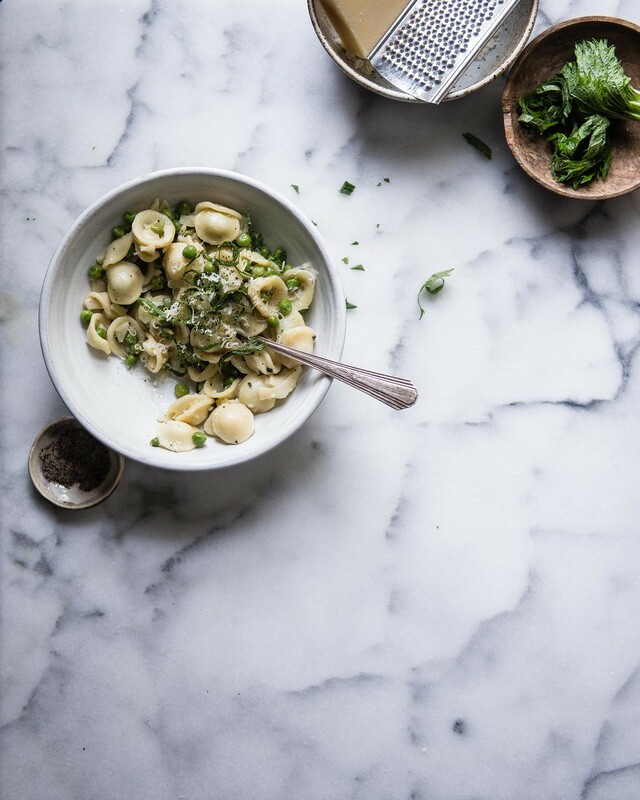 I totally agree, orecchiette and peas forever. I’m right there with you! My kids are 2 & 5 now but the early back to work days are still pretty fresh in my mind. And oh my goodness, the bottle battles (straight up feeding strikes!) were EPIC for us. I have the biggest bottle collection ever in my attack to show for it. I really hope yours ends soon! Sigh, I feel you! Enjoy your nights and weekends together, but also the best parts of your job too! My girls have been talking a lot lately about what they want to be when they grow up, and that does help a little to ease the mom-work feels. Tomorrow is our anniversary and I’m planning this as a surprise to my spouse. Hope she likes it, I might try with long pasta. Any comments on the idea? Oh my goodness!! I’m honored! I think long pasta would work just fine. 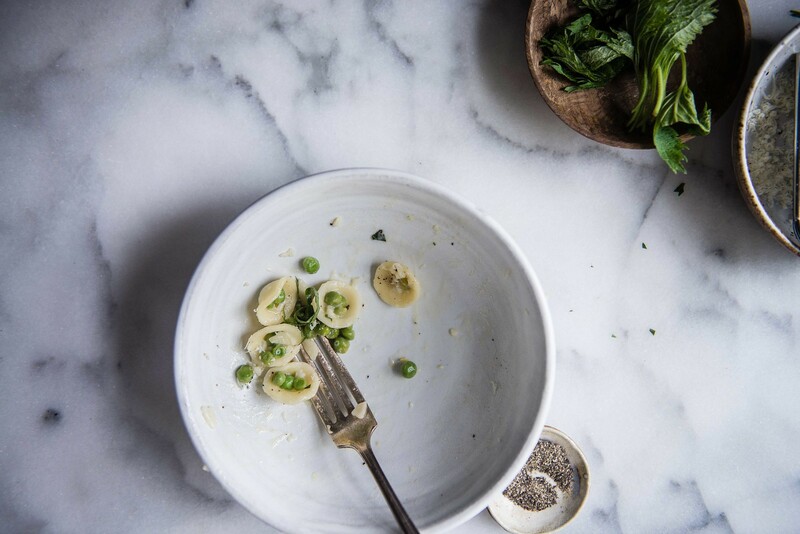 The peas might have a tendency to collect at the bottom of the bowl a bit more than with cup-shaped pasta like orecchiette, but that wouldn’t be a big deal to me. I’ve made a variation on this with spaghetti and enjoyed it too. Crossing all my fingers that you enjoy the pasta tomorrow! 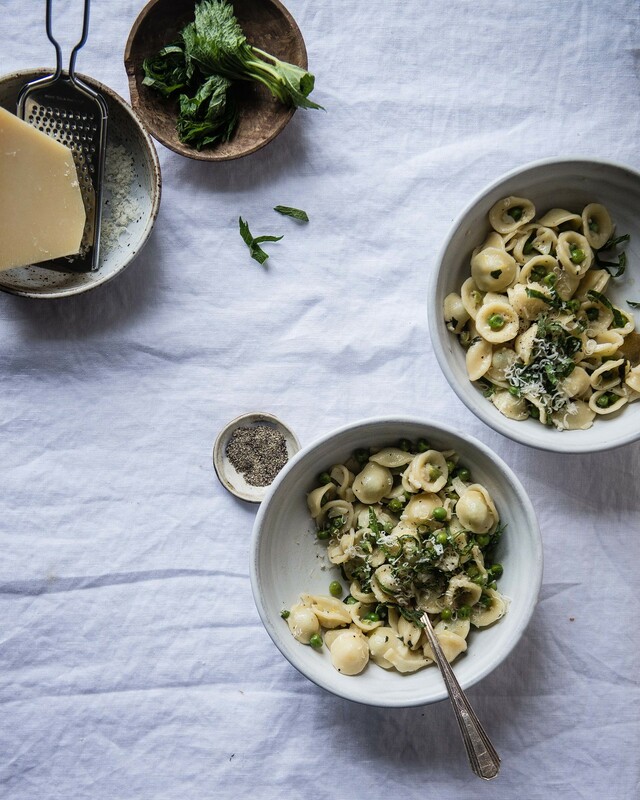 looks lovely and amazing, helped by beautiful photography, but also wonderful ingredients, love that you’re adding mascarpone and shiso leaves with the pasta, thank you for this recipe! Motherhood is full of so many tough choices, isn’t it? I’m 10 years into the parenting adventure and I still feel like I need to work on figuring things out. It’s refreshing to hear how much you cherished your time at home because it’s something I feel like I often take for granted. Hooray for simple pastas AND special pastas- that touch of mascarpone definitely takes it up a notch. Love that adorable smile in that last photo! This is so, so good. Made with gluten-free shells and mint, and it was still delicious…so simple and fresh. Even the Hubs who doesn’t care for pasta kept complimenting it.